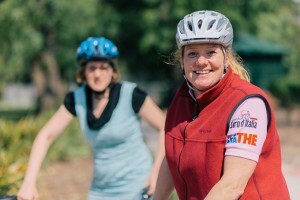 Bronnie will be leading an overnight ride for Port Phillip Bicycle Users Group along the Lilydale-Warburton Rail Trail. The Rail Trail is an iconic 40km recreation trail for walkers, cyclists and horse riders. The trail travels past vineyards, beautiful mountain scenery, farmlands and forests. Meet 8am sharp at Flinders St station on Lilydale line platform. Return Melbourne @5pm Sunday 18 Oct. If you are considering booking a child, please contact Bronnie on 0417 337 993 to discuss their suitability. St Kilda Cycles rent panniers, if you need them. An information evening will be held at the BUG general meeting on Wed 7 Oct at 6.30pm at the EcoCentre and will specifically cover preparation for touring. All participants are encouraged to attend. Contact: Bookings essential (Click here) or call Bronnie on 0417 337 993 or contact the BUG at ppbugrides@gmail.com.